The unbeaten Godolphin colt had his first trial since his resounding five lengths win on debut at Rosehill in November and wasn’t out to run records in his 4 1⁄4 f heat on the inside grass. Tassort sat behind the leader and easily gained the upper hand in the last 0 with his rider James McDonald allowing him to do just enough to win the trial by a decisive margin of 1.3 lengths from the unraced Heart Breaker. However his time of 55.79 seconds on the soft 6 surface was considerably slower than the fastest 2YO heat won by Born A Warrior, an unraced I Am Invincible colt from the Peter and Paul Snowden yard. Born A Warrior, a $1.4 million yearling purchase, really stopped the clocks when he sped over the 4 1⁄4 f to win by almost four lengths in 53.99 seconds, some 1.8 seconds quicker than Tassort. Covert Ops, another I Am Invincible colt trained by Gerald Ryan, also ran quick time wining his 2YO heat in his first appearance since his photo finish second in the Breeders Plate at Randwick in September. Ridden by Brett Prebble, Covert Ops ran 54 seconds flat after using his natural speed to take control of his heat from the start. Dual Everest winner Redzel and Caulfield Guineas winner The Autumn Sun both finished fourth in their trials. 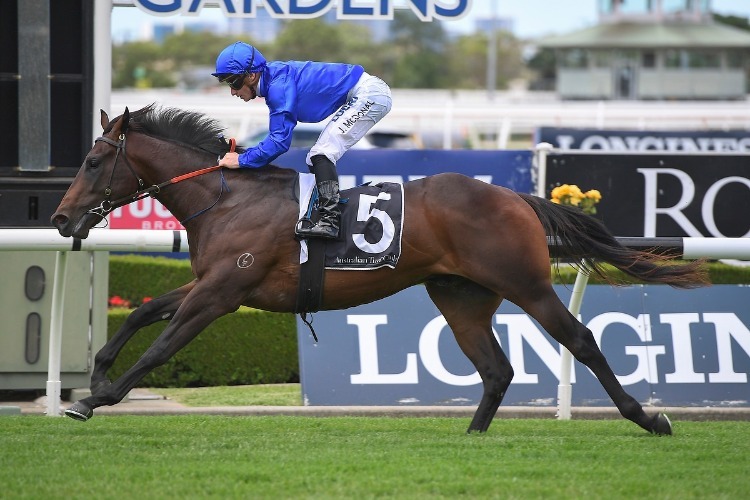 The Autumn Sun, preparing to resume in the Hobartville Stakes at Rosehill on February trialled in blinkers but didn’t have the sprint to match his classy stablemate Zousain as that colt won the only 5 f heat on the course proper for Group and Listed horses in 59.08 seconds. Zousain, having his second trial since he finished second to Sunlight in the G1 Coolmore Stud Stakes at Flemington in November, is set to tackle the G1 Newmarket Handicap over that same course first-up on March 9. Redzel went through the motions in his open heat over 4 1⁄2 f on the inside grass, sitting behind a line of three leaders and railing up to be beaten only half a length in a blanket finish in an effort that satisfied his co-trainer Peter Snowden. “He’s only had a soft trial but I was happy with that, I thought he trialled nicely,” said Snowden. The quality mare Dyslexia won the heat in 54.44 seconds, the fastest time of the four trials over 4 1⁄2 f.
The unbeaten Hawkes-trained 3YO Brutal was a star of the morning, winning his 4 1⁄4 f trial in the quickest time of the eight heats over that distance (53.37 seconds).